During this session a feminist cartography of exploitation will be cross-examined in relation to a specific heritage case: Malmberget, “ore mountain”. It is a town in the north of Sweden that perforated by mining cavities will soon lose its last 2,000 remaining inhabitants as the mining activities expand. Malmberget is thus literally going to disappear from the map. In current processes of documenting what is still left, I foreground the unprecedented feminist history of Malmberget (since 1900), which is often left out in the male-dominated mining history. The same applies to indigenous actors—the Sámi, who co-exist with the mine, and whose activities have been heavily interfered with by the environmental destruction wrought by mining activities. And refugees have found temporary places to stay within this scenery of resource exploitation. To assemble the diverse perspectives, this project adopts a posture that Rosi Braidotti has termed “we-are-in-this-together-but-we-are-not-one-and-the-same” and will engage with the architectural archive of ArkDes (Sweden’s national centre for architecture and design) in Stockholm with a large collection of plans and architectural photography. 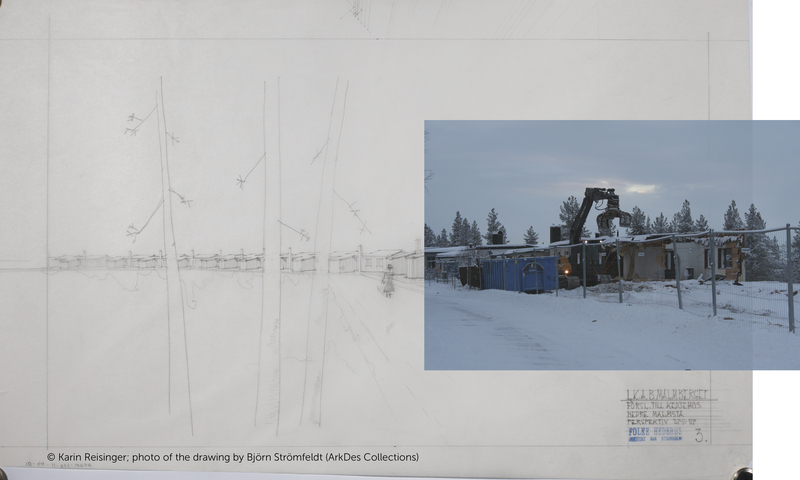 Thus, instead of accumulating new objects, the project seeks to diversify the heritage of Malmberget by adding narratives to the existing material to show how we are in this together, spatially and epistemologically. Karin Reisinger is an architect with a PhD in Visual Culture from Vienna UT (Grass Without Roots: Towards Nature Becoming Spatial Practice). After teaching the seminar Art in Changing Environments at Vienna UT (Institute of Art and Design) and a seminar entitled Feminist Ecologies at the Academy of Fine Arts Vienna (Institute of Art and Architecture), Karin is research fellow at ArkDes (Sweden’s national centre for architecture and design) in Stockholm, following a postdoctoral fellowship in Critical Studies in Architecture at KTH Stockholm (2016-2017), which allowed her to engage with the mining areas of North Sweden. Resulting book chapters include “Insomnia: Viewing Ecologies of Spatial Becoming-With” in After Effects: Theories and Methodologies in Architectural Research (forthc. 2018, Actar), “Abandoned Architectures: Some Dirty Narratives” in Architecture and Feminisms: Ecologies, Economies, Technologies (2018, Routledge), and “Connective Oscillations: Architectures Between the Devil and the Deep Blue Sea” in More: Expanding Architecture from a Gender-based Perspective (forthc. 2018, Didapress). Karin co-organised the conference “Architecture and Feminisms: Ecologies, Economies, Technologies” (2016) before Karin Reisinger and Meike Schalk edited the Architecture and Culture issue 5(3) called “Styles of Queer Feminist Practices and Objects in Architecture,” and the field issue 7(1) called “Becoming a Feminist Architect,” both 2017.